Samsung are releasing an App which will stop users from Texting and Driving, which they have called “In-Traffic“. It is currently being trialled in the Netherlands, but soon should end up global. I’m all for this app, mostly as I’ve mentioned a few times I’ve had on-coming cars nearly drive into me while holding a phone in-front of them, on top of the steering wheel. 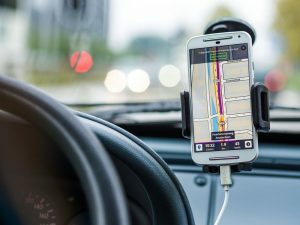 There isn’t much information about how the app will work exactly but it seems it uses the phones GPS and various Sensors to detect if your in a vehicle or a bike. I would guess it monitors your speed over the last minute or two, and if your moving faster than say 6mph it activates. It would need to monitor some previous time frame to allow for slow moving traffic and traffic lights etc. I actually thought Voice Automation with apps like Siri, OK Google and Alexa etc would progress to the point where they would read messages and allow a response long before more draconian methods like this came into play. I had a Tom Tom 910 a long time ago which used to read text messages out, I remember a particularly embarrassing occasion where it read out a sexting while my mum was driving. I have been looking for a decent app to move to the next track or play certain songs, or to mute my music on command, I think a driving app which allows more voice control should be the future and a huge seller. This is where Samsung should be focussing its money rather than blocking access. You can almost fully use voice controls for SatNav, when I have been lost, I simply say “OK Google, Directions to X”, it comes up on the screen in the Magnetic Phone Holder, I press navigate and off it goes. I would like the ability to be able to say “Navigate” or “Go”, if you are listening Google ;). The AirVent magnetic phone holders are great for SatNav usage, I have mine charging while on SatNav so the phone gets VERY hot, having it on the cool air works brilliantly. One of the interesting features of Samsung Phones are the air motions. These are basically when playing music you can wave you hand to the right, which moves to the next track, or to the left for the previous track. There are a bunch of “Air Motions”, I have to wonder how they would fair in a phone mounted in a car. 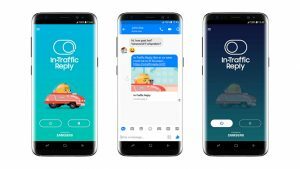 It seems the “In-Traffic” app would automatically reply to text messages, its not clear if this would include Facebook Messenger, Skype, WhatsApp, Kik and others, presumably it would be for all messengers. It either responds with a standard “Sorry I’m Driving, I’ll get back to you soon.” or it can do “Fun” replies, which are expected to be animation or possibly Gifs, I’m not sure, what the “fun” method is for. However it would be cool if the app read out the message, and replied automatically, that way you would know if it were urgent and you needed to find a safe and legal place to pull over and deal with it. There are lots of unanswered questions, such as how will know if you’re a passenger or a driver ? Apps like the excellent Waze do a really good job of this, and ask you if you are a passenger or driver. I would like to see this be a little more complicated. Perhaps ask you to press a number of buttons in a certain timeframe which a driver would be unable to do, I’m not sure. I expect many idiots would attempt this while driving and cause more accidents. Texting While Driving image by Roman Pohorecki, Sat Nav image by Pixabay.